1. Delivery. If it is lost or damaged in transit, we will repair or replace it. 2. Satisfaction. If you don't like it, you may return it for a full refund, and we will pay for return shipping. 3. Service. If it breaks, we fix it. If any of our furniture is lost or damaged in shipping to you, we will replace or repair it at our expense, regardless of the actions the carrier. We do ask that you check for and note any damage on the shipping receipt, so that we can be compensated, but even if you don’t, we will see that you get what you ordered in mint condition. You do not assume any risk and will not have to negotiate with a bureaucracy. You may return any piece of catalogued furniture purchased from us (that is, not custom or customized) for any reason within 14 days of delivery for a full refund, and we will pay for return shipping. You must retain any crating or packing that was not removed by the carrier in their normal delivery process and repack the furniture for return. Call us. We will arrange to have the carrier pick up the furniture. When we receive the furniture, we will refund all your money. 1. 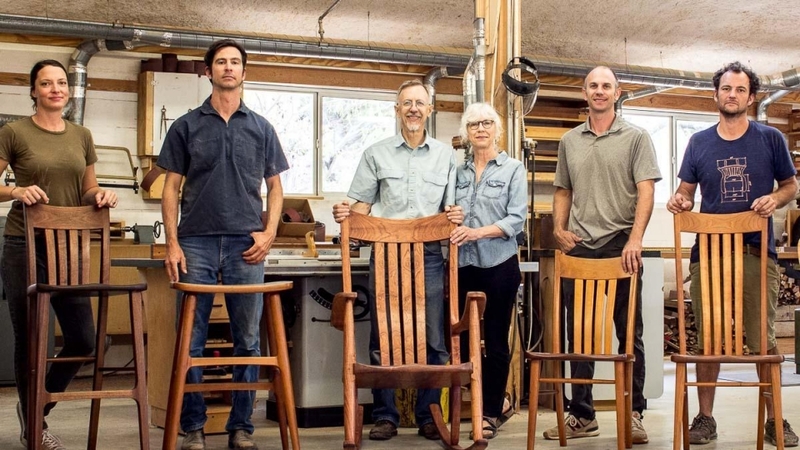 Because a set of dining furniture is a large investment for you and for us, we will send a side chair at our expense for you to test for design, comfort, workmanship, and finish. After you have seen a chair and placed an order, we cannot take dining furniture back for reasons other than failure in service. 2. Because of logistics, we cannot take any furniture back that is shipped outside the 48 states. If a piece of our furniture breaks or fails during the lifetime of the original purchaser, and as long as there are no signs of abuse or misuse, we will repair or replace it at no charge. If a failure occurs in the first five years of service, we will pay all shipping charges to have the furniture picked up and returned. If a failure occurs after five years of service, but before ten, the purchaser and we will share the shipping charges, one half each. If a failure occurs after ten years of service, the purchaser will pay the shipping charges. Rocking chairs used on covered porches and any furniture used in commercial or institutional settings are guaranteed for five years. Shipping charges allocated as above.